From dazzling cities and snow topped mountains to magnificent rainforest, British Columbia is a province of spectacular contrasts. The province’s west coast location gives it a temperate climate with warm dry summers and winters much milder than most of Canada. The province as a whole has high employment and is expected to create 500,000 new jobs by 2020. 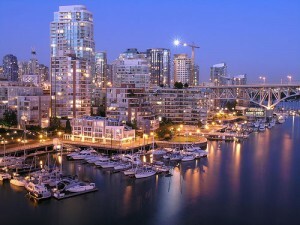 Vancouver is a thriving economic hub with excellent career prospects and support for new businesses. Families moving to British Columbia will find an excellent school system and a huge variety of summer and winter activities to keep all ages occupied. Consistently voted as one of the top three most liveable cities in the world, Vancouver is a bustling, cosmopolitan city rich in culture. The cities scenic location between the ocean and the mountains mean you’re never far from some outdoor adventure, from skiing to sailing. As the financial centre of Western Canada, there are also excellent career and business opportunities. British Columbia’s beautiful capital is situated on the scenic Vancouver Island just a short ferry or sea plane ride from the mainland. There is a strong economy centred on the thriving technology and tourism sector but with the islands beautiful beaches, forests and mountains right on your doorstep, it’s easy to maintain a good work-life balance. Just across the Strait of Georgia from the capital, Nanaimo is the gateway to Vancouver Island and boasts a bustling waterfront and breath-taking mountain views. This thriving city is packed with flourishing local businesses and has some of the best seafood in BC. On the shores of the stunning Lake Okanagan, this idyllic city is one of the fastest growing in British Columbia largely due to the booming tourism industry. The Lake and surrounding valley offer boating, golfing and hiking during the summer and perfect ski conditions during the winter at the nearby Big White and Silver Star resorts. The area is also an important wine region with pretty vineyards such as the Mission Hill Winery bringing in further investment. British Columbia is connected by an extensive system of well-maintained roads and the car remains the most popular choice for travellers around the province. There are good metropolitan bus services around most larger communities, particularly around Vancouver and the southwest. For commuters to and from Vancouver, there is the popular SkyTrain metro network which connects the city centre with many popular suburbs. Via Rail operate a service from Vancouver to Kamloops and Jasper and across Canada to Toronto and from Jasper to Prince Rupert and Amtrak also run regular trains from Vancouver to Seattle. British Columbia’s dramatic landscape makes it one of the best places in the world for outdoor adventures from sailing and golf in the summer to skiing, ice climbing and snowmobiling in the winter. For skiers and snowboarders moving to British Columbia, the powder-covered peaks of Whistler-Blackcomb boast some of the best slopes in North America. Glacier National Park is one of the most ecologically significant regions in the country with ancient cedar trees as well as bears and caribou and its spectacular scenery is perfect for climbing and hiking. For a more relaxing natural encounter, visit the naturally warm pools and incredible horseshoe caves of the Ainsworth Hot Springs in the southwest of the province. The cosmopolitan delights of Vancouver are well worth the trip with Robson Street alone home to some of the best shops and restaurants in the country. The world class Art Gallery and Aquarium and stunning waterfront understandably draw millions of visitors each year.